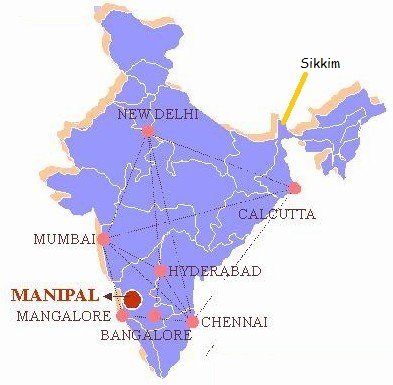 Every Manipal student, faculty or resident at one or the other times will come across people who don’t really know the exact geographic location of Manipal and have the misconception that it is in Sikkim or worse still in one of the Seven sisters of the North East! Some of the readers of this post may still have this misconception! So this post is inspired by a page started on Facebook by an enterprising student of Manipal University, Manipal – Karnataka! The page (probaby inspired by the not so unpopular SRK movie dialogue – My name is Khan, and, I am not a terrorist!) goes by the name My name is Manipal University & I am not in Sikkim. And has gone viral over the past few days. Here are what students are saying about this common misconception! Me-nahi uncle manipal in karnataka. uncle-acha,wahh! sikkim manipal walon ne karnataka mein bhi branch khol dia. So guys and gals.. share your experiences with us and spread the word!